Hey guys, I haven't posted anything really since the RCT3 days, but I'm back again with a new park that took me months of work! This park will be a story park mainly focusing on realism, as I'll try to keep it as realistic as possible. Here goes, enjoy! Found my grandpa's old journal in the basement while I was snooping around. It has extremely well documented photos of our local theme park, and I would just love to share them with you. Adventure Mountain has been open for about a month now and all is going swell. I've taken my family here 4 times already, and have noticed that the park is constantly busy. I mean being only 30 minutes outside Seattle doesn't hurt foot traffic. Today, however I decided to take some pictures of the park on my camera and keep them in this journal so maybe my grandchildren can see it. I took this picture through my windshield while entering the park. Tickets to park ain't bad at $5 a pop. Parking lot was filled to the brim today. Entering the park is $10, which is quite pricey, but definitely worth it for my family. The carousel is the first thing to the left of the fountain. The one thing I enjoy about the entrance plaza is the old European theme. A restaurant, dubbed Village Burgers is diagonal to the main entrance, and a delicious spot to eat. Ye Olde Gift Shop is behind the Carousel, and a great place for souvenirs. This is a better shot I got looking towards Kiddie Cove, the children's area. Music Express is the only flat ride in the plaza, and it sure is popular! Kiddie Cove is themed to pirates, which my son absolutely loves. The only theater in the park is this small theater which hosts shows for the kids. There is a decent amount of flat rides in this area. This ride made me nauseous, I don't know how my kids enjoyed it so much. This area hosts a decent food stand for kids and their parents. And it includes a nice seating area! Even the bathrooms have a nice pirate theme too. On the next page I'll include more of the themed areas, but for now it seems I'm running out of room to write! I like the trash in the parking lot. It's those little touches that make the scene more real. I also like the positioning of the gift shop; surrounded by cobblestone paths. And that shady bench to the left of the gift shop looks nice and inviting. I'm not too keen on the dinginess of the photos. Yeah, I know they're supposed to be 'old and faded'. But it takes away from the beauty of your park and makes the details hard to see. The dinginess was appropriate for first couple of photos taken from the windshield; you'd expect those to be dim. But overall, I'm liking what you're doing with this park/presentation. Nice to see you back at SGW. Your new park looks great. Simple, but very realistic. I chuckled at the pic with the caption, "There is a decent amount of flat rides in this area." There may be enough flat rides, but apparently not enough restrooms. Looks like a fun little park. I also noted the trash in the parking lot and was wondering how you did that? Did you find a way to place it yourself or did you have to herd some peeps through there hoping they'd drop something? Thank you very much! And no the trash was completely unintentional! The peeps just happened to walk through the parking lot and drop that, but hey it works! The theme park dubbed Adventure Mountain is on track to open in 1975 if all goes well. This park is in a prime location, only being 30 minutes outside Seattle. The park's owner and designer, Ronald O'Neill is bringing life to the suburban area. O'Neill dreamt of a Disney style theme park out in Washington, in other words a massive fantasy style theme park. However due to a tight budget, unfortunately O'Neill's dreams had to be scaled back significantly. A river pierces through the center of the park, and this river was supposed to be host of jet ski shows, an underground roller coaster, and a pier. These are just some of the few things that will not be in the park during opening season. However, O'Neill is still excited to bring life to the area, and so is everyone else. It is quite unfortunate that only some of O'Neill's ideas could even be realized. However, walking through the park in some areas you can feel the fantasy-vibe. The area right behind the plaza is dubbed Fairy Kingdom. It has a medieval-like atmosphere. 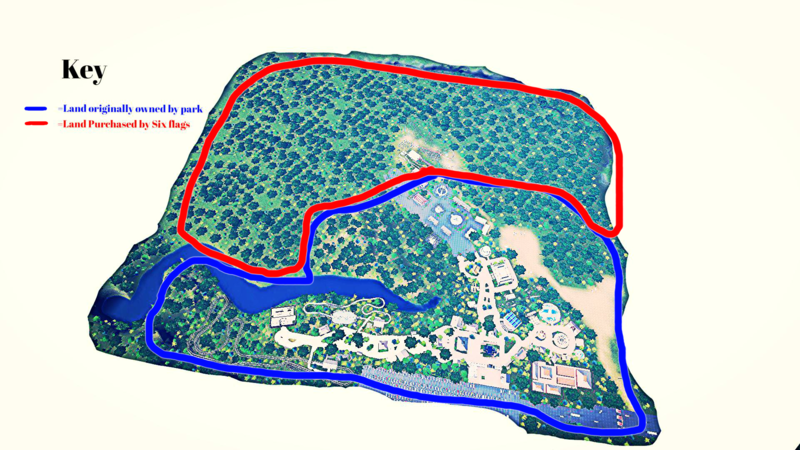 It is not a big area compared to the other areas of the park. However, it does contain the park's largest restaurant, Castle Feast. A vintage car ride, dubbed Witch Hunt, takes children and their families on a ride through a spooky forest. My kids loved it! A swing ride, called Fairy Flyer flys right next to the trees. The next area right behind the Fairy Kingdom is Midway: USA, a boardwalk themed area, with the most flat rides in the park. There are many food options here, such as Hot Dog Time. A bumper cars ride, dubbed Traffic Jam, sits at the end of the Midway. The most popular ride, by far, is Radius. There are a multitude of games to play in this area to win cool prizes! I managed to grab this cool shot from the ferris wheel. The area is definitely the most vibrant area at night. It probably is my favorite area, as it's very open which alleviates the crowds, and my kids and I can enjoy so many different things to do in this area. Whoops, look like a ran out of this page, I got one more area to go over! I'll put that on the next page. This all looks great so far. The landscaping really stands out for me. The buildings are simple but in a realistic / budget appropriate way. And I have no problems at all with the filter you've chosen, really sets the timeframe well. I admire the economy of force of your buildings. They're complex enough to impress with their details yet simple enough to impress even more for doing that while being relatively austere. Excellent balance. I really need to learn how to do that. Thanks so much, this is my first real Planet Coaster project so that means a lot! I finally have room to show the last section of the park, Adventure National Park, a wilderness-themed section. It is by far the most popular area of the park, being directly next to the main entrance and hosting the park's only roller coaster. Even with the entrance you can see the massive amounts of trees left undisturbed in order to keep the wilderness vibe. A log flume ride, Timber Falls, also sits in the area. This ride is immensely popular as well. What I enjoyed most about Timber Falls was the ride through the trees you take before heading to the drop. The Cabin is the main restaurant in this area, serving burgers, chicken, and fries. It is immensely popular. The Grizzly is the only roller coaster in the park. It is a hell of a ride, bringing you out and back through the forest. I really hope this ride stays for a long time. ...judging by the line, it sure will be here for a long time. I managed to grab this shot of a train returning to the station before I rode. It's hard to see how far back this ride goes, I could only really snap this from when I was exiting. I think today is the last day I'll visit the park this season, until next year! I am loving the presentation of your screenshots and the park itself looks very classical. Taking the first person perspective is a fun take on posting screenshots, and it also makes the park feel even more realistic. Well done. A new season brings new things! Got here early, but not early enough, considering the entrance line was gone (because everyone was in the park already). But you couldn't tell from this snap I got of the entrance plaza. However, the line for Timber Falls was insane! And it wasn't even that hot out. When I came off soaked, the April air really hit me, and I was freezing the rest of the day! The new thing this season is a theater. The theater sits at the end of Adventure National Park, and hosts multiple shows throughout the day. The theater, dubbed Fort Adventure, takes on a wilderness outpost theme. The area is built on recently cleared land, expanding the area further into the forest. This allows for better shots of Grizzly, but not by much. Along with the theater came a drink stand, which sure is popular for those who just waited in line for Grizzly and need something to quench their thirst! I've been working so much and haven't really been able to visit the park, but this time I made it towards sunset and into night, and managed to grab a few shots of the park at night. Nothing new this season except rumors that a theme park company might buy up the park, I think they're just rumors though. The line for Fairy Flyer never seems to be too long. I managed to capture this gorgeous shot of the sun setting on the midway. As the sun fell--and my family got hungry--we decided to enjoy a nice meal of burgers and fries at Castle Feast. The entry plaza looks wonderful at night. It never seems to be busy over here, as everyone is enjoying the rest of the park. I like that peacefulness. In the hot summer months, Timber Falls stays open throughout the night! Riding Grizzly at night is terrifying, yet awesome. I won't be able to make it back until next season, I guess we'll find out if the rumors are true then. Really good start! I feel like the buildings are a bit tall, but your layout and composition looks great! Thanks a lot, I'm not the best at building as you can tell haha, but I see what you mean. I won't really have time to visit this season, but I did manage to get with my family one day and visit the park, and changes are coming! A rising theme park corporation, Six Flags, has purchased the local theme park, Adventure Mountain for an undisclosed amount. The park's owner Ronald O'Neill will maintain a stake in the park as part of this deal. Six Flags already boasts four other theme parks; as Six Flags Over Texas, Six Flags Over Georgia, Six Flags Great Adventure, and Six Flags Over Mid-America. This park will sure be in for a treat as Six Flags has already announced plans to buy up more land around the park to expand it as well as add a new coaster produced by Arrow for the 1979 season. Not sure if this is good news or bad news. I have a brother who lives in New Jersey and says that since Six Flags bought Great Adventure he's seen significant improvements in that park. Hopefully this new coaster will be a good one. I figure this is the spot where the new coaster will be, at the end of Midway:USA. Land clearing has begun already, but not much else besides that. So far the only thing other changes I've noticed since the Six Flags purchase is the signage change on the park entrance, but nothing more. I'll sure find out next season what's in store! Re: Six Flags Adventure Mountain - 1979 New Roller Coaster! A new roller coaster was built over the offseason in the land previously shown behind Midway:USA. The roller coaster is an Arrow looping coaster dubbed The American Arrow. It is about 90 feet tall and features one loop and two corkscrews. The Six Flags signage is just an addition to the old signage. Besides that not much else has changed. You can see American Arrow towering over the Midway. A new food stand, Pizza Pizza, was added to the area. The entrance provides some interesting landscaping, which must be terrible for anyone allergic to bees. Considering I got to the park early, the line wasn't awful, but still 40 minutes from here. The cars actually contain the name of the coaster on it. Here's a shot of the beginning of the coaster. And of course the gut wrenching corkscrews. The line really grew by the time I left. I managed to grab this shot of the area right before I went home for the night. Beautiful new addition. The coaster was fantastic, my family and I sure loved it! Re: Six Flags Adventure Mountain - 1979 - New Roller Coaster! Wow. That new is Arrow is sure popular with those huge lines. The park is looking very good. It's definitely got that Six Flags feel to it. Only one little criticism I might add is that some of the open plazas look very large and empty. But other than that, everything else looks very realistic. Thanks a lot! The reasoning for the open plazas is I attempted to model the area off of Six Flags Great Adventure's Boardwalk area. There is a lot of open space in it in real life, but tbh I don't love it either. I figure I'd make use of the open space and drop a restaurant or souvenir shop or something in the open areas eventually. I just couldn't figure out what to do with it now without making the area too small. Beautiful day to go to the park! However it was not too busy today. ..but it was hot, and Timber Falls was a crazy wait. Thank god for coffee, not sure how else I'd survive this day. I've noticed that Hot Dog Time, which used to be an open-air restaurant, now has glass windows. The line for American Arrow is unsurprisingly.... long. I did ride it at night, and I loved it! Such a great feeling. Nothing new has been announced for next season, however I am loving the way Six Flags is handling the park. I'm sure constant expansion will continue into the future. Until next season. It seems that I am going very fast with this park with an update each day, this is because in real life I am actually ahead of the updates, and am trying to play catch up. Thats all! Sorry for the constant updates for anyone viewing! Nothing really new this season except for a couple of street characters added! Patrick the Pirate greets kids as they enter Kiddie Cove. Penny the Princess stays in Fairy Kingdom. ..and Wilderness Wendy greets guest in the Adventure National Park section of the park. Other than that the park was not crowded today and my kids and I rode Traffic Jam 5 times in a row! Radius seemed to be having problems today. I managed to grab this rendering from someone who works in the park. When Six Flags purchased the park they also purchased a lot of land around the park. Apparently Six Flags is planning on doubling the size of the park (why wouldn't they with the amount of land purchased), and this graphic better shows the sheer size of the land purchased by Six Flags. For next year already Six Flags has announced a new section with a restaurant and two new flat rides! Land clearing has begun in the area, as well as extra land clearing for a planned expansion in 1982. We'll see what next year brings!